Fearing myself close to some kind of breakdown over renewed stress as a result of my sister’s situation I realised I needed to do one of my favourite things to unwind. I don’t think I’ve ever mentioned my love for Westerns/Cowboy films. Growing up in the UK in the 1970s one of my favourite past-times was going to the pictures (movies) with my Dad. Often on the weekend we would see three films in the one day, invariably Westerns. When you live in a cold, bleak, grey, urban environment, the call of the wild, wild West is irresistible. Those wide open spaces of Wyoming, Oklahoma, Arizona, Texas with horses and cowboy boots, where the possibility of adventure could happen at any given moment, were my idea of paradise. I have spent countless afternoons roaming the wild frontier with the likes of John Wayne, Henry Fonda, Glenn Ford and Stewart Granger. I have seen most Westerns from The Magnificent Seven when I was a kid to the remake of 3:10 To Yuma as an adult, and have enjoyed them all. 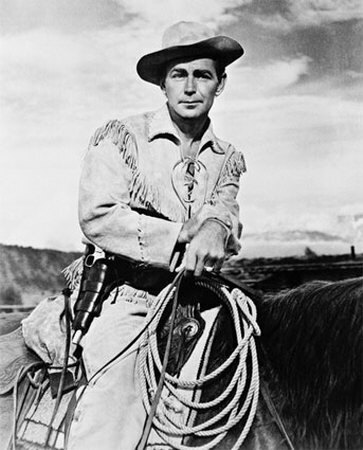 But my favourite cowboy movie of all time is Shane starring Alan Ladd, which I watched today. It is still amazing. Shane is a gunfighter who arrives in a quiet town and gets involved in a feud between homestead owners and cattlemen. Despite killing a few guys (as cowboys in movies tend to do) he values honour above all things and actually tells the little boy he befriends to stay away from guns. I remember feeling intoxicated by this noble man who could just ride into a town, make a difference, and then ride out again. I wanted a Stetson, and boots and a horse. I wanted to ride the lonesome prairie with men called Hoss and Roscoe Lee. I wanted to take a rattler out with one shot and cook my dinner under the stars. I wanted to stand on a hilltop with the sun in my face and see forever. Funny how the things you loved as a child, when revisited as an adult, still mean as much. I wanted to be a cowboy then. I still do. My dad used to take my younger brother and I to the theater near our house, but we would see the “spaghetti westerns”, with the likes of Clint Eastwood. When I see them on TV now it brings back a certain nostalgia. Is that the one with the “Shane… Shane… don’t go Shane…” that my mom was always going on and on about? ‘Rio Bravo’ was my favourite … just about every Western cliché there ever was in one film, when you analyse it, but still very good. ‘Butch Cassidy and the Sundance Kid’ was a close second. you would make an awesome cowboy. I wonder if the things we loved and revisit years later might mean even more to us – remembering the excitement of the movies and being with your dad. What a lovely memory to share with us all…My Dad is still a huge John Wayne fan. And Clint Eastwood’s spaghetti-Western years, too. Have you seen John Wayne’s “The Alamo”? Lisa’s Dad– John R. Allender’s– favorite! I’m glad to hear you are taking time to enjoy things for YOU. Actually, if I think about which movies my Dad preferred, especially when I was young, I would definitely say Westerns. And so I know all the actors you’re talking about. Don’t remember seeing Shane, but maybe I’ll actually treat myself and take a trip down memory lane too. LINDA – I am a huge fan of the Clint Eastwood Westerns, particularly The Outlaw Josey Wales. No one wore a poncho like Clint! BRITT – that’s the one. Your Mum and I have a LOT in common. You are both such cool ladies. PAISLEY – oh yes, that is a brilliant one. I’ll have to watch it again. TRAVELRAT – yes to both, but particularly Butch and Sundance. I LOVE that film so much. MELEAH – I already have the boots. I got them in Texas years ago. They’re my hippie cowboy boots – they’re pink and purple. Yeeee Haaaa! MOMO – I know. It’s devastating. I cry every time I think of that little boy at the end. KATE – I think that’s very true. There are so many memories associated with those old movies for me that revisiting them is like sitting down with an old friend. I also remember the fun my Dad and I used to have trying to do the accents and the cowboy squint – looking menacing and nonchalant at the same time. Those were the days! LISA – love The Alamo. John Wayne really was in a class of his own. Thank you again for your wonderful advice the other day. It helped me so much! SPASMICALLYPERFECT – so nice to meet you. Thanks for visiting. You should try and see Shane if you can. It’s a classic. As a child I loved it when my two young Uncles invited me to go and see one with them. The music to the films made them even more unforgettable. My Hubby would watch every single one of them shown on T.V regardless of quality.He muddles the names of the actors up, but one he always knows-John Wayne. Oh I’m laughing at Britt’s comment. My mom and dad took me and a bunch of little girlfriends to the movies for my 5th birthday and guess what it was? And the ONLY thing I remember about that movie is “Shane! Shane! Come back Shane!” I got chills when I read this!! DIAMONDS – the music was fantastic, wasn’t it? I am so glad you have that lovely childhood memory and that your hubby enjoys the Westerns too! NANNA – that line does stick in your head, doesn’t it? For years I wondered if he ever came back! Hi Selma, you should check out HBO’s DeadWood (on DVD), especially the first series, and especially Robin Weigert as Calamity Jane. Hi Selma, there’s a Buffy,Deadwood connection, Joss’s brothe, Zack was a PA and writer for for Deadwood. What a family, their dad, Tom Whedon wrote for Captain Kangaroo, The Golden Girls, Benson, Alice, and other shows. DAVID – I had no idea. What a talented family! Shane, by Jack Schaeffer, was a set work book at school. I really enjoyed the story. I think we might have watched the movie in class, too, but I can’t remember.